The progress and development of digital technology do not necessarily produce harmful effects, as those who still feel the smell of film developing emulsion like to say. The development of photographic technology has not only increased the power of camera, but also brought out the already rejected or hardly ever used potentials of this medium. Back in 1918, Alvin Langdon Coburn, a confirmed modernist, said that camera is an instrument of fast vision. This statement was an echo of the futuristic apotheosis of machine and speed. The cult of future and ever faster vision (perhaps too fast - Cartier-Bresson) in conjunction with irresistible and irrepressible development of all technologies, create an unconscious longing for that pure quality of handicraft, when pictures bore an imprint of the aura of the ones who had taken them. The history keeps pushing us towards the edge of the realistic period, while photographers, although willing to make that fateful leap forward, still linger on the safe ground where they are in control of the unexpected and timidly try to re-discover photograph through the evolution of this medium. Camera has been a longtime companion of Josip Šarić and he is one of those whose advancement in photography has been inseparably connected with digital technology. Although he could easily rely on the host of impressive possibilities offered by new technologies, he runs his eye over a chosen motive again and again until he feels that the decisive moment has come, when a single move of the index finger captures a moment and turns it into eternity. There is no serial shooting, frantic comparing of shots and filing away piles of almost identical pictures. Nothing of that, just one press on the release button - one perfect picture. In his case, that colourful reality becomes a part of his own jigsaw, reassembled shot by shot, slowly and without any haste. Everything is subordinated to colour, which he uses as the basis in the process of separation of his own reality from the reality of the surrounding space that we all see. Although it usually goes the other way round, because our attention is primarily attracted by objects, while colours are only an accompanying part of our surroundings, Šarić manages to evade even the relentless reality that is supposed to be one of the attributes of colour photographs. Consciously manipulating all the photographic tools, like frames and exposition, as well as the possibility of subsequent correction of colours to adjust them to the vision that made him press the release button, Šarić creates pictures that fascinate you with the tranquility of their motives, which bear some qualities attributable to fine art. Thus he even slightly enhances the realistic effect which he uses as his own narrative instrument. Each of his photographs is a small essay, one of those countless stories that happen everywhere, every moment, but only those who are really dedicated manage to recognize and capture them. The desire to preserve something forever seems to be inseparable from his profession. An archaeologist cannot be but calm, thoroughgoing and always ready to see, in the same moment, both the detail and the whole it belongs to. Furthermore, in his conscious and rather utopian attempt to preserve the spirit of the past through new technologies, Šarić conveys a part of his own aura to that singular moment. Milan Živković - "REFOTO", magazine for culture of photography, no. 35, June 2006. He lets the sight speak, without interrupting it. Breathe with itself and its poetics. Stone, plants, colors, landscapes, people and their (un)usual situations, city facades, dawns and dusks, closed compositions opening up before us, fragments that invite us to concetrate and speak more than a rambling whole. He watches carefully, listens carefully, curious and wandering. There is not a single particle of negligence: he's analytical, and ready to react fast. Misses are possible, but he doesn't wear them as scars. Josip Šarić (Zemun, 1957) graduated from the Belgrade University Faculty of Philosophy Archeology Department, where he gained his master and doctoral degree. Employed in the Institute of Archeology as senior scientific associate. He worked on many archeological sites. Traveler. With longer or shorter breaks, he's been engaged in photography since elementary school. Continuously since 2004. 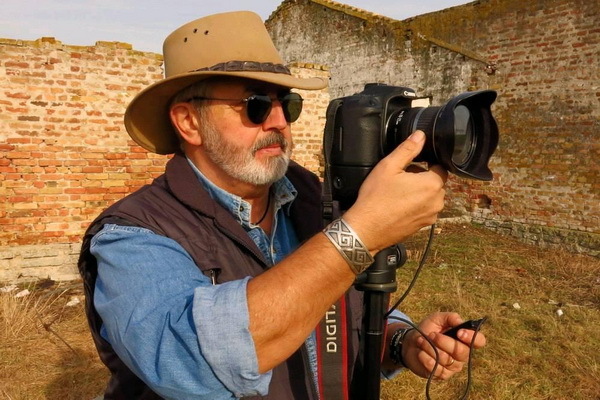 He began with an "Altix" and now uses "Canon EOS 40D", "Nikon D3100" and "Canon EOS 7D Mk2". He's got a refined feeling for color, composition and detail, for the internal drama and narration of the picture. He says that the aesthetics and composition of photograph are created by nature, people and their traces. The author should intervene as little as possible: just to correct the exposition and polarization filter. He published his photos in magazines DigitalFoto, ReFoto, New Review, Open Sea, World of Photography, National Review... Exhibited at international photography salons in Niš, Zaječar, Sarajevo... Winner of many reputable competitions (Wikimedia, National Geography, "Panasonic", "On the Palm of the Hand"...). Today, after everything, he knows that photography is a terra incognita. The Photographer and the observer search for their way through it, searching for their own being. Branislav Matić, Serbia - "National Review", no. 62, June 2017. The contents of this site are under Copyright of the author. You cannot reproduce or diffuse its contents, even partial, without authorization.